Our research program is focused on the chemical modification of polymers for use in high-value engineering applications. Using knowledge of the relationships between polymer structure and end-use performance, the structural inadequacies of polyolefins and elastomers are defined and remedied through chemical modification. Our aim is to develop commercially viable chemistry for the production of advanced polymeric materials. Research projects range from studies of the structure-property relationships of new materials to detailed analyses of reaction kinetics and selectivity. While the focus remains on the development of advanced polymers, model compounds are studied extensively to determine the underlying chemistry of modification processes. Most projects therefore involve organic synthesis, reactive polymer processing, spectroscopic characterization and polymer property assessment. anhydride, vinylsilanes) to yield high-value products for the automotive, packaging, and composites industries. Research projects in this area range from "blue-sky" methods of improving reaction selectivity to product engineering exercises focused on the preparation of polyolefin nanocomposites for advanced automotive applications. Novel elastomers are being developed by nucleophilic substitution and cycloaddition reactions of commercial materials such as halogenated butyl rubber and polybutadiene. These projects are concerned not only with the yield, rate and selectivity of polymer modifications, but also with the physical and chemical properties of the product. Extensive use is made of model compounds that represent the reactive functionality of a polymer to create new chemistry, while studies of polymeric systems provide the data needed for product development. A. Ozvald M.R. Kleczek, A.C. Rodrigo, J.S. Parent, Isobutylene-rich Imidazolium Ionomers: Influence of Ion-pair Distribution and Counter-anion Structure, Rubber Chemistry and Technology, in press. A.C. Rodrigo, K. Vikram Siva Shanmugan, R.A. Whitney, J.S. Parent, Functional Macromonomer Derivatives of Poly(isobutylene-co-isoprene), Canadian Journal of Chemical Engineering, in press. S.L Bacon, A.J. Daugulis, J.S. Parent, Isobutylene-rich Imidazolium Ionomers for Use in Two-phase Partitioning Bioreactors, Green Chemistry, 18, 6586-6595, 2016. B.M. Molloy, K.A. Johnson, R.J. Ross, J.S. Parent, Functional Group Tolerance of AOTEMPO-Mediated Peroxide Cure Chemistry, Polymer, 99, 598-604, 2016. M.R. Kleczek, R.A. Whitney, J.S. Parent, Synthesis and Characterization of Thermoset Imidazolium Ionomer Derivatives of Brominated Poly(isobutylene-co isoprene), Reactive and Functional Polymers, 106, 69-75, 2016. S.L Bacon, A.J. Daugulis, J.S. Parent, Effect of polymer molecular weight distribution on solute sequestration in two-phase partitioning bioreactors, Chemical Engineering Journal, 299, 56–62, 2016. C. Twigg, E. Mueller, B.M. Molloy, J.S. Parent, Peroxide-initiated Chemical Modification of Poly(isobutylene-co-isoprene): H-atom Transfer Yields and Regioselectivity, Journal of Polymer Science, Part A: Polymer Chemistry, 54, 3102-3109, 2016. E.C. Peterson, D. Contreras-López, J. Harris, J.S. Parent, and A.J. Daugulis, Two-phase Partitioning Bioreactors: Strategies for organic acid extraction by polymer absorption. Chemical Engineering Journal, 287, 503–510, 2016. S. Bacon, E. Peterson, A.J. Daugulis, J.S. Parent, Impact of thermodynamic affinity, crystallinity and glass transition temperature on the rational selection of polymers for two-phase partitioning bioreactors (TPPBs). Biotechnology Progress, 36, 1500-1507, 2015. J.M. Dakin, K. Vikram Siva Shanmugam, C. Twigg, R.A. Whitney, J.S. Parent, Isobutylene-rich Macromonomers: Dynamics and Yields of Peroxide-Initiated Cross-linking. Journal of Polymer Science, Part A: Polymer Chemistry, 53, 123–132, 2015. Y. Zhang, J.S. Parent, M. Kontopoulou, C.B. Park, Foaming of reactively modified polypropylene: Effects of rheology and coagent type. Journal of Cellular Plastics, 51(5–6), 505–522, 2015. J.M. Dakin, R.A. Whitney, J.S. Parent, Imidazolium Bromide Derivatives of Brominated Poly(isobutylene-co-paramethylstyrene): Synthesis of Peroxide-curable Ionomeric Elastomers, Industrial and Engineering Chemistry Research, 53, 17527–17536, 2014. J. Dafoe, J.S.Parent, A.J Daugulis, "Block copolymers as sequestering phases in two-phase biotransformations: Effect of constituent homopolymer properties on solute affinity," Journal of Chemical Technology & Biotechnology, 89, 1304–1310, 2014. S.L. Bacon, J.S. Parent, A.J. Daugulis, "A framework to predict and experimentally evaluate polymer-solute thermodynamic affinity for two-phase partitioning bioreactor (TPPB) applications," Journal of Chemical Technology & Biotechnology, 89, 948–956, 2014. G.E. Garrett, E. Mueller, D.A. Pratt, J.S. Parent, "Reactivity of polyolefins toward cumyloxy radical:Yields and regioselectivity of hydrogen atom transfer." Macromolecules, 47, 544–551, 2014. B.M. Molloy, D. K. Hyslop, J.S. Parent, "Comparative Analysis of Delayed-Onset Peroxide Cross-linking Formulations," Polymer Engineering and Science, 54, 2645-2653. 2014. Y. Zhang, P. Tiwary, H. Gui, M. Kontopoulou, J.S. Parent, Crystallization Of Coagent-Modified Polypropylene: Effect of Polymer Architecture and Cross-Linked Nanoparticles. Industrial and Engineering Chemistry Research, 53, 15923–15931, 2014. J.R. McNeish, J.S. Parent, R.A. Whitney, "Halogenated poly(isobutylene-co-isoprene): influence of halogen leaving-group and polymer microstructure on chemical reactivity," Canadian Journal of Chemistry 91, 420-427, 2013. A. Ozvald, J.S. Parent, R.A. Whitney, "Hybrid Ionic/Covalent Polymer Networks Derived from Functional Imidazolium Ionomers,"Journal of Polymer Science, Part A: Polymer Chemistry 51, 2438–2444, 2013. D.K. Hyslop, J.S. Parent, "Dynamics and Yields of AOTEMPO-mediated Polyolefin Cross-linking," Polymer 54, 84-89, 2013. D.K. Hyslop, J.S. Parent, "Functional Nitroxyls for use in Delayed-onset Polyolefin Cross-linking," Macromolecules 45, 8147-8154, 2012. K. Vikram Siva Shanmugam, J.S. Parent, R.A. Whitney, "Design, Synthesis and Characterization of Bismaleimide Co-curing Elastomers," Industrial and Engineering Chemistry Research 51, 8957-8965, 2012. K. Vikram Siva Shanmugam, J.S. Parent, R.A. Whitney, "C-H Bond Addition and Copolymerization Reactions of N-Arylmaleimides: Fundamentals of Coagent-assisted Polymer Cross-linking," European Polymer Journal 48, 841-849, 2012. J.S. Parent, M. Capela, J.T. Dafoe, A.J. Daugulis, "A First Principles Approach to Identifying Polymers for Use in Two-Phase Partitioning Bioreactors," Journal of Chemical Technology & Biotechnology 87, 1059-1065, 2012. J.S. Parent, A. Porter, M. Klezcek, R.A. Whitney, "Imidazolium Bromide Derivatives of Poly(isobutylene-co-isoprene): A New Class of Elastomeric Ionomers," Polymer 52, 5410-5418, 2011. J. S. Parent, S.M. Malmberg, R.A. Whitney, "Auto-catalytic Chemistry for the Solvent-free Synthesis of Isobutylene-rich Ionomers,"Green Chemistry 13, 2818-2824, 2011. B.I. Chaudhary, J.M. Cogen, J.S. Parent, "Thermal Analyses of Organic Powders Made From Precipitation Polymerization of Triallyl Monomers," Journal of Thermal Analysis and Calorimetry 105, 279-285, 2011. M.A.J. Faba, J.S. Parent, R.A. Whitney, "CO2-derived Latent Nitrogen Nucleophiles for Controlled Cross-linking of Brominated Poly(isobutylene-co-isoprene)," Polymer Engineering and Science 51, 1592–1598, 2011. M.A.J. Faba, J.S. Parent, R.A. Whitney, "Reactions of N-Alkylbenzaldimines with Brominated Poly(isobutylene-co-isoprene): New Delayed Onset Cure Chemistry," Industrial and Engineering Chemistry Research 50, 680–685, 2011. S. Xiao, J.S. Parent, R.A. Whitney, L.K. Knight, "Synthesis and Characterization of Poly(isobutylene-co-isoprene)-derived Macro-monomers," Journal of Polymer Science Part A: Polymer Chemistry 48, 4691-4696, 2010. S. Malmberg, J.S. Parent, D.A. Pratt, J.K. McLean, R.A Whitney, "Isomerization and Elimination Reactions of Brominated Poly(isobutylene-co-isoprene)," Macromolecules 43, 8456-8461, 2010. J.S. Parent, S. Malmberg, J.K. McLean, R.A. Whitney, "Nucleophilic Catalysis of Halide Displacement from Brominated Poly(isobutylene-co-isoprene)," European Polymer Journal 46, 702-708, 2010 [More information]. J.K. McLean, S.A. Guillen-Castellanos, J.S. Parent, R.A. Whitney, K. Kulbaba, A. Osman, "Phase-Transfer Catalyzed Esterification of Brominated Poly(isobutylene-co-isoprene)," Industrial and Engineering Chemistry Research 48, 10759-10764, 2009 [More information]. K. El Mabrouk, J.S. Parent, B.I. Chaudhary, R. Cong, "Chemical Modification of PP Architecture: Strategies for Introducing Long-chain Branching," Polymer 50, 5390-5397, 2009 [More information]. W. Wu, J.S. Parent, S.S. Sengupta B.I. Chaudhary, "Preparation of Crosslinked Microspheres from Hydrocarbon Solutions: A New Adaptation of Precipitation Polymerization Chemistry," Journal of Polymer Science, Part A: Polymer Chemistry 47, 6561-6570, 2009 [More information]. S.S. Sengupta, J.S. Parent, B.I. Chaudhary, "Selectivity of Coagent-mediated Polypropylene Maleation," Polymer Engineering and Science 49, 1945-1950, 2009 [More information]. J.S. Parent, A. Bodsworth,S.S. Sengupta, M. Kontopoulou, B.I. Chaudhary, D. Poche, S. Cousteux, "Comparative Analysis of Coagent-assisted Polypropylene Branching Chemistry, ," Polymer 50, 85-94, 2009 [More information]. W. Wu, J.S. Parent, "Polymer Functionalization by Free Radical Addition to Alkynes," Journal of Polymer Science, Part A: Polymer Chemistry 46, 7388-7394, 2008 [More information]. J.S. Parent, S.S. Sengupta, M. Kaufman, B.I. Chaudhary, "Coagent-induced Transformations of Polypropylene Microstructure: Evolution of Bimodal Architectures and Cross-linked Nano-particles," Polymer 49, 3884-3891, 2008 [More information]. J.K. McLean, S.A. Guillen-Castellanos, J.S. Parent,R.A. Whitney, R. Resendes, "Synthesis of Graft Copolymer Derivatives of Brominated Poly(isobutylene-co-isoprene)," European Polymer Journal 43, 4619-4627, 2007 [More information]. M. Kontopoulou, Y. Liu, J. R. Austin, J.S. Parent, "The dynamics of montmorillonite clay dispersion and morphology development in immiscible ethylene-propylene rubber/polypropylene blends," Polymer 48, 4520-4528, 2007 [More information]. J. A. Lee, M. Kontopoulou, J. S. Parent, "Rheology and Physical Properties of Polyethylene / Polyethylene-Ionomer Blends and their Clay Nanocomposites," Macromolecular Rapid Communications 28, 210-214, 2007 [More information]. J.S. Parent, R. Parodi and W. Wu, "Radical Mediated Graft Modification of Polyolefins: Vinyltriethoxysilane Addition Dynamics and Yields," Polymer Engineering and Science 46, 12, 1754-1761, 2006 [More information]. S.A. Guillen-Castellanos, J.S. Parent, and R.A. Whitney, "Synthesis of Ester Derivatives of Brominated Poly(isobutylene-co-isoprene): Solvent-free Phase Transfer Catalysis," Macromolecules 39, 2514-2520, 2006 [More information]. S.S. Sengupta and J.S. Parent, "Comparative Analysis of Radical-Mediated Polyethylene Modifications: Vinyltriethoxysilane versus Mercaptopropyltriethoxysilane Addition," Polymer Engineering and Science 46, 480-485, 2006 [More information]. J.S. Parent, W. Wu, S.S. Sengupta and Peter Jackson, "Mechanism and Selectivity of 2,3-Dimethyl-2,3-diphenylbutane Mediated Addition of Vinyltriethoxysilane to Polyethylene," European Polymer Journal 42, 971-980, 2006 [More information]. S.A. Guillen-Castellanos, J.S. Parent, and R.A. Whitney, "Synthesis and Characterization of Ether Derivatives of Brominated Poly(isobutylene-co-isoprene)," Journal of Polymer Science, Part A: Polymer Chemistry 44, 983-992, 2006 [More information]. J.S. Parent, A. Liskova, R.A. Whitney and R. Resendes, "Ion-dipole Interaction Effects in Isobutylene-based Ammonium Bromide Ionomers," Journal of Polymer Science, Part A: Polymer Chemistry 43, 5671-5679, 2005 [More information]. S.S. Sengupta, J.S. 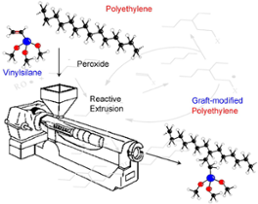 Parent and J.K. McLean, "Radical-Mediated Modification of Polypropylene: Selective Grafting via Polyallyl Coagents," Journal of Polymer Science, Part A: Polymer Chemistry 43, 4882-4893, 2005 [More information]. J.S. Parent and S.S. Sengupta, "Terminal Functionalization of Polypropylene by Radical-Mediated Thiol-Ene Addition,"Macromolecules 38, 5538-5544, 2005 [More information]. J.A. Lee, M. Kontopoulou and J.S. Parent, "Synthesis and Characterization of Polyethylene-based Ionomer Nanocomposites,"Polymer 46, 5040-5049, 2005 [More information]. R.A.Whitney, A. Penciu, J.S. Parent, R. Resendes and W. Hopkins, "Cross-Linking of Brominated Poly(isobutylene-co-isoprene) by N-Alkylation of the Amidine Bases DBU and DBN," Macromolecules 38, 4625-4629, 2005 [More information]. J.S. Parent, A. Liskova and R. Resendes, "Isobutylene-based Ionomer Composites: Siliceous Filler Reinforcement," Polymer 45, 8091-8096, 2004 [More information]. J.S. Parent, A. Penciu, S.A. Guillen-Castellanos, A. Liskova and R.A. Whitney, "Synthesis and Characterization of Isobutylene-based Ammonium and Phosphonium Bromide Ionomers," Macromolecules 37, 7477-7483, 2004 [More information]. J.A. Lee, M. Kontopoulou and J.S. Parent, "Time and Shear Dependent Rheology of Maleated Polyethylene and its Nanocomposites," Polymer 45, 6595-6600, 2004 [More information]. M.E. Scott, J.S. Parent, J. Dupont and R.A. Whitney, "Controlled Radical Grafting: Nitroxyl-Mediated Maleation of Model Hydrocarbons," Industrial & Engineering Chemistry Research 42, 3662-3670, 2003 [More information]. J.S. Parent, G.D.F. White, D. Thom, R.A. Whitney and W. Hopkins, "Sulfuration and Reversion Reactions of Brominated Poly(isobutylene-co-isoprene)," Journal of Polymer Science, Part A: Polymer Chemistry 41, 1915-1926, 2003 [More information]. J.S. Parent, M. Mrkoci and S.L. Hennigar, "Silica Agglomeration and Elastomer Reinforcement: Influence of Surface Modifications,"Plastics, Rubber and Composites 32, 114-121, 2003 [More information]. M. Spencer, J.S. Parent and R.A. Whitney, "Composition Distribution in Poly(ethylene-graft-vinyltrimethoxysilane)," Polymer 44, 2015-2023, 2003 [More information]. J.S. Parent, M. Tripp and J. Dupont, "Selectivity of Peroxide-Initiated Graft Modification of Ethylene Copolymers," Polymer Engineering and Science 43, 234-242, 2003 [More information]. J.S. Parent, S. Cirtwill, A. Penciu, R.A. Whitney and P. Jackson, "2,3-Dimethyl-2,3-diphenylbutane Mediated Grafting of Vinyltriethoxysilane to Polyethylene: A Novel Radical Initiation System," Polymer 44, 953-961, 2003 [More information]. M.E. Scott, J.S. Parent, S.L. Hennigar, R.A. Whitney and M.F. Cunningham, "Determination of Alkoxyamine Concentrations in Nitroxyl-Mediated Polymerization Products," Macromolecules 35, 7628-7633, 2002 [More information]. T.G. Gopakumar, J.A. Lee, M. Kontopoulou and J.S. Parent, "Influence of Clay Exfoliation on the Physical Properties of Montmorillonite/Polyethylene Composites," Polymer 43, 5483-5491, 2002. J.S. Parent, G. White and R.A. Whitney, "Synthesis of Thioether derivatives of Brominated Poly(isobutylene-co-isoprene)," Journal of Polymer Science Part A: Polymer Chemistry 40, 2937-2944, 2002 [More information]. J.S. Parent, G.D.F. White, R.A. Whitney and W. Hopkins, "Amine Substitution Reactions of Brominated Poly(isobutylene-co-isoprene)," Macromolecules 35, 3374-3379, 2002 [More information]. J.S. Parent, M. Spencer and R.A. Whitney, "Influence of Hydrogen Donors on Peroxide-Initiated Melt Grafting of Vinylsilane to Poly(ethylene-co-vinyl acetate)," Journal of Applied Polymer Science 83, 11, 2397-2402, 2002. N. Bavarian, M.C. Baird and J.S. Parent, "EPDM Synthesis by the Ziegler Catalyst Cp*TiMe3/B(C6F5)3," Macromolecular Chemistry and Physics 202, 3248-3252, 2001. J.S. Parent, D.Thom, G. White, R.A Whitney and W. Hopkins, "Thermal Stability of Brominated Poly(isobutylene-co-isoprene),"Journal of Polymer Science, Part A: Polymer Chemistry 39, 2019-2026, 2001. J.S. Parent, N.T. McManus and G.L. Rempel, "Insights into the Selectivity of Nitrile Butadiene Rubber Hydrogenation by OsHCl(CO)(L)(PCy3)2, (L=vacant or O2)," Journal of Applied Polymer Science 79, 1618-1626, 2001. J.S. Parent, K. Geramita, S. Ranganathan and R.A. Whitney, "Silane-Modified Poly(ethylene-co-vinyl acetate): Influence of Comonomers on Peroxide-Initiated Vinylsilane Grafting," Journal of Applied Polymer Science 76, 1308-1314, 2000. J.S. Parent, N.T. McManus and G.L. Rempel, "OsHCl(CO)(O2)(PCy3)2 Catalyzed Hydrogenation of Acrylonitrile-Butadiene Copolymers," Industrial and Engineering Chemistry Research 37, 4253-4261, 1998. J.S. Parent, N.T. McManus, G.L. Rempel, W. Power and T.B. Marder, "Ligand Exchange Processes of OsHCl(CO)(L)(PR3)2, (L=vacant, H2, R'CN, O2; R=Cy or i-Pr)," Journal of Molecular Catalysis A. Chemical 135, 285-293, 1998. P.D. Dholabhai, J.S. Parent and P.R. Bishnoi, "Equilibrium Conditions for Hydrate Formation from Binary Mixtures of CH4 and CO2 in the Presence of Electrolytes, Methanol and Ethylene Glycol," Fluid Phase Equilibria 11, 235-246, 1997. J.S. Parent , N.T. McManus and G.L. Rempel, "RhCl(PPh3)3 and RhH(PPh3)4 Catalyzed Hydrogenation of Acrylonitrile-Butadiene Copolymers," Industrial and Engineering Chemistry Research 35, 4417-4423, 1996. J.S. Parent and G.L. Rempel, "Solubility of Hydrogen in Chlorobenzene," of Chemical and Engineering Data 41, 192-194, 1996. J.S. Parent and P.R. Bishnoi, "Investigations into the Nucleation Behaviour of Natural Gas Hydrates," Chemical Engineering Communications 144, 51-64, 1996. P.D. Dholabhai, J.S. Parent and P.R. Bishnoi, "Carbon Dioxide Hydrate Equilibrium Conditions in Aqueous Solutions Containing Electrolytes and Methanol," Industrial and Engineering Chemistry Research 35, 819-823, 1996. J.S. Parent, R.A. Whitney, A. Liskova, R. Resendes, "Process to Produce Silica-Filled Elastomeric Compounds," United States Patent 7,237,736, 2007. G.L. Rempel, N.T. McManus and J.S. Parent, "Catalytic Hydrogenation of Polymers," United States Patent 5,561,197, 1996, Awarded to the University of Waterloo; Sponsored by Bayer Rubber. J.S. Parent, R. Resendes, R.A.Whitney, S.A. Guillen-Castellanos; Halobutyl Elastomers, PCT Int. Appl. (2007), WO 2007016770 A1 20070215., 2007. R.Resendes, J.S. Parent and R.A. Whitney, "Liquid Maleated Butyl Rubber," Provisional United States Patent Application 60/698,252 filed July 11, 2005, Sponsored by Lanxess, 2005. Students will expand their knowledge of functional group interconversions and C-C bond forming reactions learned in ENCH 245, and apply retrosynthetic analysis to propose multi-step syntheses of organic target molecules. Selection of reagents, solvents and reaction conditions will be examined in the context of process safety, reaction yield, product isolation, and profitability. This will be followed by studies of target molecule recovery by extraction, recrystallization, distillation and chromatography. The design component of the course is a series of two-hour design challenges in which student teams generate solutions to process development problems. This includes proposing reaction sequences for producing a target molecule, conducting safety analyses of hazardous reactions, choosing from multiple synthetic routes, and recommending separation trains for product isolation. This course is concerned with the application of thermodynamics to practical problems of the chemical industry. Emphasis is placed on the study of phase equilibrium, including vapour-liquid equilibrium and liquid-liquid equilibrium. Contemporary methods of calculating the thermodynamic properties of non-ideal vapours and liquids will be presented and applied. The principles of chemical reaction equilibrium will also be studied. The design component of the course will require students to perform theoretical vapour-liquid equilibrium calculations and recommend proper operating conditions for a single-stage unit (flash drum) that separates a non-ideal binary mixture. The design and manufacture of polymer products is reviewed, with particular emphasis on material selection and processing technology. The engineering properties of elastomers, thermoplastics, adhesives, fibers and coatings are discussed in terms of processing characteristics and end-use performance. Industrial processing operations such as extrusion, molding, mixing and film manufacture are presented in detail. The design component of the course requires students to select appropriate materials and processing methods for an engineering application. Examples include medical catheters, engine gaskets, drug capsules and biodegradable packaging. In this course students will participate constructively on teams to create solutions to open-ended complex problems, using standard design methods and tools. This project-based course provides instruction primarily in the first 6 weeks of the semester focusing on problem scoping, creativity and idea generation, decision making incorporating technical, economic, societal, and environmental factors, safety, engineering codes and regulations, and engineering ethics. The final 6 weeks of the course centre around a design project delivered by each discipline. The first half of the course examines the elements of polymer science that relate to engineering applications. This includes the thermodynamics of polymer phase transitions and solutions, as well as phase adhesion, polymer degradation and elasticity. The second half of the course examines polymer-processing operations with an emphasis placed on the analysis of polymer flow. Specific topics include the rheology of thermoplastic melts, viscoelasticity, constitutive equations and polymer blends. The chemical structure and reactivity of industrial catalytic compounds are surveyed, with particular emphasis on the integration of fundamental organic, inorganic and surface chemistry with the engineering principles of transport phenomena and thermodynamics. Catalytic systems to be studied are acid-base catalysis in solution, coordinative catalytic reactions of organometallic complexes, enzyme mediated reactions, and heterogeneous catalysis by zeolites, functionalized surfaces and supported metals. Commercial applications of these technologies are stressed along with the underlying chemical principles. The design component of the course requires students to work in teams to develop two different catalytic processes. These projects stem from examples covered in class, and include encapsulated enzyme bioreactors, catalytic distillation units, fluidized-bed olefin polymerization reactors and/or multi-phase olefin oligomerization processes. Tutorials are used extensively as design sessions. ENCH 245 builds upon concepts learned in CHEM 211 and 212; an introduction to a large number of organic reaction mechanisms is the main focus of the course, supplemented by examples of industrial chemical processes that demonstrate practical applications of these reactions.